Mumbai, April 17: France’s Notre-Dame Cathedral which has been severely damaged in a massive blaze caused due to a construction accident, is valuable for its historic value as well as for the treasure trove of ancient art and artifacts that it houses. The blaze has damaged large parts of the ancient structure but initial reports suggest that many if not most of the artworks and artifacts have in fact been saved from the fire due to the timely effort by Paris’ firefighters. Laurent Nuñez, junior interior minister, said it was a close thing, but the “majority were not damaged”. 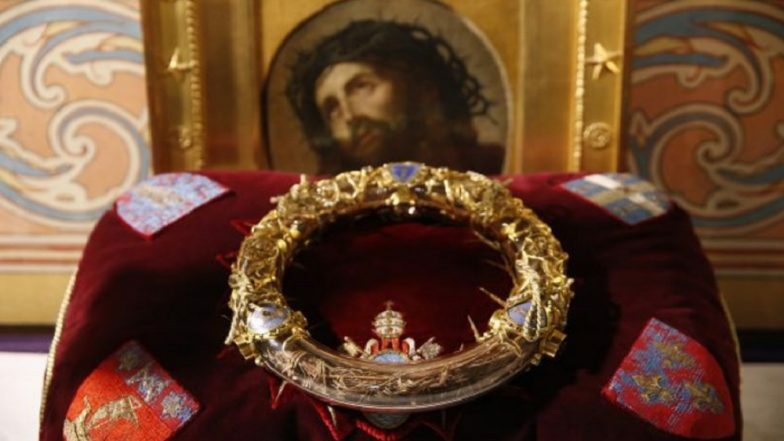 One of the most prized possessions of the cathedral, the crown of thorns supposedly worn by Jesus as he was crucified and which was brought to France from Byzantium by King Louis IX, later Saint Louis has been saved and moved to a secure location after the fire. In the Notre-Dame's structure, the three great medieval rose windows which represent Mary the Virgin, the baby Jesus, and Christ in his majesty on the west, north and south sides did not suffer catastrophic damage, said Franck Riester, France’s culture minister. The minister said a number of large paintings in the body of the cathedral that were too large to be removed during the fire had not been burnt but were damaged by smoke and water. They include vast canvases in honour of the Virgin Mary offered in the 17th century by the goldsmiths’ guild. Notre-Dame’s famed organ which has a two-and-a-half year waiting list for playing before the fire, has escaped destruction. With five keyboards, 109 stops and almost 8,000 pipes, the great organ is the largest of the cathedral’s three such instruments. Built in the 15th century, the organ was progressively added to over the centuries to become one of the largest in France. It has however been damaged by debris, dust and water, Notre-Dame organist Philippe Lefèvre told AFP. The largest and oldest of the cathedral's bells is known as the Bourdon Emmanuel. The bell which was cast and installed in the south tower in 1685, weighs 13 tonnes, with its clapper alone weighing at 500 kilograms. The tenor bell, considered one of the finest examples in Europe, is chimed only on special occasions and important Catholic events. The level of damage to the bell is not yet known but the cathedral's two square bell towers escaped relatively unscathed. Despite the heroic efforts of the fire-fighters, Notre-Dame's famous spire collapsed during Monday's fire, which dates back to the 12th Century. It is one of the most iconic sights that used to mark Paris’ skyline. The spire underwent several changes in the building's history - including being dismantled during the French Revolution, and later rebuilt in the 1860s.